2016 has arrived, and with it comes optimism and potential for an exciting gaming year ahead. Though plenty of eyes are turning to the next generation of Nintendo hardware, of course, we nevertheless have a fairly busy line-up on the way for 3DS, the portable that continues to keep us busy. As in previous years, if in doubt we'll be taking some cues from the latest investor's update, and as is often the case with the 3DS Nintendo has resisted announcing projects too far ahead of release; as a result many of these are either confirmed for this year or relatively safe bets. There are some provisos here, primarily in games we've left out from the main list due to split releases between regions. We've done this to give more games coming to players in 2016 time in the sun, but we will include the following in the poll at the end. As always you'll be able to vote for your choice, so without further ado let's list some of the biggest games coming to 3DS in 2016. In light of the sales success for Fire Emblem: Awakening reviving the series, Nintendo and Intelligent Systems will be hoping that this dual release (as it will be in North America) will hit it off with the public in the same way. It's close to release in North America but is frustratingly still TBC in Europe; with the key 'choice' bringing two separate core campaigns, and a third to be available as a download along with more DLC, this could be a strategy title to keep us busy for much of the year. The E3 2015 reveal for this was blown ahead of time by Tecmo Koei, and this is certainly an interesting release. The cross-over / spin-off was popular on Wii U, and now arrives on the portable with all previous DLC included and new characters, such as Tetra and newcomer Linkle. There'll be more fairly skilful button mashing and seemingly endless levelling up to indulge in, and this will provide a welcome action gaming fix. Ok, put away the pitchforks and hear us out. This is a title that wasn't exactly warmly welcomed following its E3 2015 reveal, yet it is the latest project from Next Level Games, a studio that's done terrific work with Nintendo's franchises and most recently brought us Luigi's Mansion: Dark Moon. The art style and the idea that the next Metroid Prime will be a co-op portable shooter starring chibi-style Federation Force troopers is hardly what fans had in mind, but this could actually be a good game at its core. Time will tell, and we're keen to give it a chance. Take a game developed by Monolith Soft and Bandai Namco, also featuring franchises from SEGA, Capcom and now Nintendo, and you have an RPG that sounds like a slam dunk. This one's predecessor certainly had a mastery of cross-Universe insanity, even if some of its mechanics weren't quite on the money, and we're hoping this sequel improves key areas while maintaining the energy of its predecessor. Another welcome RPG sequel that's getting localised for the West, this time with Square Enix stepping forward. Its predecessor was warmly received, with an attractive visual style combining well with the adventure, and prior to the sequel's release in Japan the development team emphasized that new ideas and a lot of content are included in End Layer. Another lengthy adventure to keep 3DS owners busy. Another part of the mini-revival for the series on Nintendo hardware, joining various other games in this list in terms of making its way belatedly out of Japan. The twist for this entry is that it's very much a multiplayer RPG, with you being encouraged to team up with others while exploring the world and tackling foes. It's drawn some comparison to the likes of the Monster Hunter franchise though, to be fair, this is a rather different proposition. Kotaro Uchikoshi can finally deliver on his vision for a third entry in the series, chronologically taking place between 999: Nine Hours, Nine Persons, Nine Doors and Zero Escape: Virtue's Last Reward. A fan campaign has been credited with helping to make it happen, and Aksys Games has promised a relatively quick localisation to the West courtesy of localised versions being worked on in conjunction with core development. These licensed tie-ins in which Mario, Sonic and chums do battle have proven to be a success over a number of years. Nintendo seems particularly keen to promote the 3DS version in Japan - we're still awaiting the Western release dates - and is no doubt banking on quickfire and easy-going fun appealing to the portable's audience. Golf and Rugby are among new sports to arrive this time around. Delayed from a planned 2015 release, it may be worth giving this one a chance. Sonic Boom: Rise of Lyric was largely panned on Wii U, but the safer 2D platforming of Sonic Boom: Shattered Crystal was better received, while developer Sanzaru Games has some decent games on its record. Could this be another solid and enjoyable portable Sonic experience? We hope so. It's a big Anniversary year for the Pokémon series, so more is likely to come, but we couldn't resist breaking our 'no Virtual Console' rule for these upcoming releases. To say the reaction among 'mon fans to this announcement was one of excitement would be an understatement, with local Wi-Fi on the 3DS eShop versions to replicate Game Boy link cable exchanges. Of course the eShop could provide some enticing games, especially on New Nintendo 3DS once the first Unity-based projects arrive. What's your most anticipated 3DS game of 2016? Fates and Paper Jam all the way! Had to vote Metroid just because it's the title we don't know enough about. All those other we know how they will play and look like. The mystery behind Metroid is intriguing! Yo Kai Watch is at the top of my list for me with Fire Emblem a close 2nd. Skepticism aside, I'm willing to not be cynical, and give federation force a good stab. It'll be nice to play a FPS on the 3DS. My vote went for Zero Time Dilemma. An easy pick though I'm really looking forwards to Fire Emblem and Bravely Second too. I wonder why there are so many games that have very different release dates for Europe and NA. Steamworld Heist might end up being the last 3DS purchase for me... system is getting very old. It seems like a high % of those games are hitting by end of March based on known dates. 3DS is gonna be a busy machine for any RPG lover. Not 100% confirmed, but the new Ace Attorney in the works would definitely be my 2016 pick. Zero Time Dilemma. It's not even close. If I could only purchase one game this year, this would be the one. Looking forward to Final Fantasy Explorers. Hopefully it's a decent game. Legend of Legacy should just be LOL, because that was my impression after reading reviews, watching gameplay, and realizing I was ever looking at that game with any interest. A perfect example of true old school gaming not being as great as the rose tinted lenses would have us believe. I voted 'game not on list' because I'm hedging my bets on Etrian Odyssey V. Both on it releasing this year and on it being a 3DS game. I voted - My game isn't on the list - b/c I'd bet almost anything that Z will be out in time for the holidays on the 3DS, even if NX is out by then. They'll wait until Gen 7 for NX. I'm guessing they'll announce XZ and YZ in March after Red/Blue/Yellow get some sales. I'm annoyed at the uncertain wait time for Bravely Second. Too bad Paper Jam didn't come out last month in NA like the other regions. Already available in NA, but i'm really looking forward to Stella Glow in Europe! This lineup looks far better than on the Wii U.
Federation force is the spin off to the new unannounced Metroid on wiiu, star fox zero is using the same control system for new Metroid with both screens working together, you heard it here first. So the third game in the zero escape series is finally becoming a thing now. Looking forward to it. Fire Emblem all the way for me, but also HW, Bravely Second and the "forgotten to be included" Dragon Quest titles. I'm also interested in Metroid FF, but if they try to shoe-horn a MP element into a single player only game then I can see it failing hard, much like Tri-Force heroes. The 3DS has a good year ahead. @MoonKnight7 In Japan, Wii U has a better line-up. The only games that are new and published by Nintendo are Metroid Prime Federation Force and Hyrule Warriors Legends, while the other games on the list are either 3rd party, out in Japan or both. Hoping Legends grabs me the same way the original Hyrule Warriors did, sunk a lot of time into that. Why aren't Dragon Quest 7 and 8 listed here? Paper Jam all the way. Can't wait for that game. We forgetting Dragon Quest VII/VIII? Otherwise super excited for FE: Fates, Mario & Luigi, Hyrule Warriors, Bravely Second, PopoloCrois, and of course the Pokémons. Great lineup for the year! Getting all the games coming out in NA. Also excited for the Dragon Quest games. Also for the new Pokemon game. Fates should be great, but End Layer is definitely my most hype Nintendo release this year. "It's drawn some comparison to the likes of the Monster Hunter franchise though, to be fair, this is a rather different proposition." You keep saying this about Final Fantasy: Explorers, but I still don't get how it's supposed to be a different proposition from Monster Hunter. How did you guys not mention the two Dragon Quest games? Not to mention Shin Megami Tensei IV Final. Seriously? Poor taste, man. Lots of gamers feel this will be the best 3DS year since 2013. I thought Metroid looked pretty great from the long gameplay videos that were shown, honestly. In fact, some of these games make me consider buying a couple more 3DSs, but I'm done with it I think. Bring on something that can sway me to portable with the NX! Though, I'm pretty certain we won't have backwards compatibility in the portable bit of NX, if there is one. And that means 3DS will probably live on for awhile. Now THIS is actually a good 2016 lineup! There are so many RPG's, which is a big plus in my book. My backlog is too great to get to all of the new titles I'd like, but hopefully I can get to one or two of them. Despite all of the troubles with Fire Emblem Fates, and the disappointing sequestration of it's paths, I'm still anticipating the special edition. Hyrule Warriors Legends and Fire Emblem Fates for sure! I'm only interested in Fates, unfortunately. Although I may get the Pokemon rereleases. I voted for Popolocrois because of a lack of Dragon Quest VII. I want a good number of these... but I'm not sure if I'm anticipating any one of them more then the other. Fates might be the closest to a "most anticipated" for me, but the blah Canadian dollar is slowly killing it... and yet, here I am, hoping for the Special Edition (mostly because, as far as I know, it has Birthright and Conquest on one cart). No love for Project X Zone? Oh well, I can't wait for it. Voted for Bravely Second because Dragon Quest VII & VIII were absent. 0 Time Dilemma without fail, Fates, Mario, Hyrule Warriors, Pokemon Yellow... In that preference. This year's looking good. My vote assuredly went to FE Fates though, incredibly excited for that one! Also, we have two Dragon Quest games on the way; 7 & 8! I voted Zero Time Dilemma, although I'll be picking that up on Vita. For 3DS, I would have voted for Dragon Quest VII or VIII if they had been in the poll. The line-up surely isn't as amazing as in previous years and it shows typical signs of a generation coming to its end, but similar to the Wii U there are enough extensive high-quality core-games among them to keep one satisfied. February is going to be a painful month for me. Very easy choice for me. Zero Time Dilemma has been my most anticipated game for a long time, and I want to play it even more than I wanted to play Zelda U. I'm so glad they were able to make Zero Escape 3. I've preordered the Vita version from the US since I really wanted the preorder watch bonus, so now I need to decide whether to buy a PS Vita to play it on, or just also buy an EU 3DS version of the game as well. As for other games, Yo-Kai Watch and Etrian Odyssey Untold 2 are my other most other wanted games. I'll give the Legend of Legacy demo a try when it's released in Europe this week before I know whether I want it. It's a bit annoying having to wait for them when the US has already got to enjoy them. I'm waiting for Hyrule Warriors Legends so I can see all the version differences before deciding whether to get the Wii U or 3DS version. The Wii U once will look prettier, but my beloved Wind Waker characters are on the 3DS version. I've got Bravely Default, so I'll need to get round to playing it before I know whether I even want Bravely Second. I'll hold off getting the Pokemon VC games for now. I've only got a 3DS, so I don't have another console to trade with. As for Fire Emblem Fates, the only FE game I've played is Awakening. I loved absolutely everything about the game, except for the gameplay. I might enjoy Fates more than Awakening since I've had a bit of experience on FE gameplay, but it may just be the sort of game that I don't find fun. I may take a chance and pick up the easier Fates version depending on how I feel once it finally gets released in Europe. FE: Fates and Hyrule Warriors Legends! Great time to be a RPG fan,I wish Nintendo Europe would tell us when Fates is coming I need that special edition now 😬 We also need a Yokai watch date ASAP. Don't want any of it. Good thing I'm so addicted to Animal Crossing that it doesn't matter if new games come to the 3DS or not. I really can't wait for Zero Time Dilemma. I can't wait until that comes out. Also, the original pokemon games are in my view for picking up. And whenever Dragonquest 7 and 8 come out will be what I am watching for as well. Am I the only one who thinks the 3DS has a much stronger and better lineup then the Wii U does this year? Either way, 2016 is going to be an awesome year for my 2DS! Between Fire Emblem Fates, Dragon Quest VII, Dragon Quest VIII, Hyrule Warriors Legends, and the VC versions of the old Pokemon games, it will be a challenge to balance my trade-in credit. And that's not even getting into the awesome games on the Xbox One. Going to be a good year for games! DRAGON QUEST!!!!!! DING DING DING DING!!!!!!!! FF Explorers is the only one I'm actually looking forward to but I'll be getting FE Fates as well as Paper Jam. The others don't really interest me. An infinitely more promising line-up than the Wii U! Dragon Quest VII and VIII, Fire Emblem: Fates, Zero Escape 3 (probably will pick it up on Vita) Bravely Second and Etrian Odyssey Untold 2 are all games I'm eagerly anticipating. Pretty much all the RPG's for me. A reminder as graceful as nails on a blackboard. Pretty good lineup overall. I've still got my hands full with HM:Project Mirai DX & AC:HHD plus HM: Story of Seasons which I decided to pick before the year was out, so I'm good for a while. & Stella Glow in place of FE:Fates. Will certainly keep an eye on Sonic Boom Fire/Ice, Hyrule Warriors Legends & Project X Zone 2 as well. Between Fire Emblem, Bravely Second, Project X Zone and Zero Escape, I'm pretty much covered for the year. Unless...isn't there supposed to be a new Phoenix Wright, too? Cripes. Zero time dilemma all the way. If you have played 999 and vlr you would understand. Where's Style Savvy 3 NoA? Just... Where? From the confirmed games, FE holds the most interest. Followed by by the EOU2, to pick up sometime. I think the most interesting games so far are the indies. I'd like to see those also. My choices unfortunately are criminally absent from the list: Shin Megami Tensei IV Final and Shakedown Hawaii for the win! Zero Time Dilemma got my vote but I'm also waiting for Hyrule Warriors Legends and Metroid Prime: FF. The only game I'm really excited for is Fire Emblem Fates. If I can get the first Bravely Default game beat in time, then sure, I'm down for Bravely Second. Final Fantasy Explorers is a maybe at this point. @Peach64 What I played of Untold 2 was a significant improvement over the original Untold. You're in for a treat if you don't mind the story mode limitations. Fire Emblem Fates all the way. End Layer also looks interesting, but I need to play Bravely Default before I even consider wanting it. Monster Hunter X is my most anticipated 3DS game...if it ever gets over here. I have Fates special edition preordered and it'll probably be a great relaxation game since the absolute bare minimum amount of strategizing is needed to play it on Normal/Hard Classic, but it'll be on the shelf until I finish my current girl's playthrough of Radiant Dawn and my first playthrough of Tear Ring Saga. Fates, Paper Jam and Zero Time Dilemma! 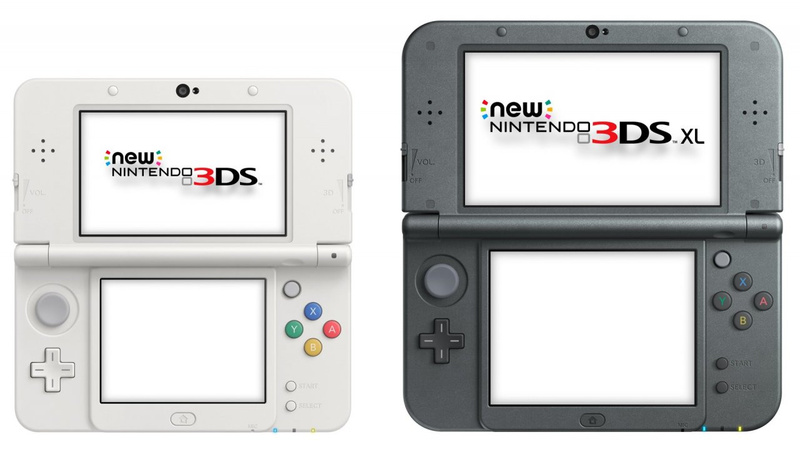 After a lackluster 2014 and 2015, 3DS is coming back in force! Why isn't DQVIIR and DQVIIIR on the list, since Nintendo is publishing and localizing them for a summer 2016 release? the currently unannounced Pokémon game that we all know is coming. Gaps between Pokémon releases are usually never bigger than a year, and 2015 was that year. And with Pokémon's 20th anniversary and the new Zygarde forms, I think it is undeniable. @Dissident I keep reading it's Monster Hunter with a Final Fantasy look. First thing NintendoLife mentions in this preview is Monster Hunter. I've got to admit... I'm not the biggest lover of RPGs... and while I'm excited to try Dragon Quest, there's not much else I'm excited for this year. I can only hope that Unity support comes soon and that there's lots of unannounced games around the corner... I need something to spend my xmas eShop credit on! I'm hyped for Federation Force as long as it's not as bad as Triforce Heroes and don't have that "you can play single player, but definitely you shouldn't and we'll disencourage you" design. That's it. The only game I plan to purchase this year after Zelda U. The 3DS is really not blowing me away at this point. I'm not a Fire Emblem fan and everything else is kinda meh. I had to vote for Pokemon R/B/Y because I know I'll be getting it day one but everything else I can pretty much take or leave. I might end up getting some of it but I'm not hyped for any of it. That doesn't mean Nintendo doesn't have something up their sleeve that has yet to be announced, though. In fact I'm positive they do. This is the 3DS swansong year any way you look at it and they aren't going to let it go without a bang. Mighty No. 9 and Gunvolt 2 (I hope) ! @sandman89 Sakamoto is not working on Metroid and neither is Retro Studios, so thrrr is no one to work on the game and it was told in a recent interview that there aren't plans for a Metroid game on the wii u, that it will be in the NX that the series will probably launch again. Not only that, this is the NEW Nintendo we are talking about, the guys who cannot give us a release date or at the very least new footage of the upcoming Zelda game. Desperately want an EU release date for fates. Fates by a mile! Awakening is one of my favorite games of all time! Fire Emblem Fates for me but if there was an Ace Attorney game in there I would go for that. Lots of good games to come out this year, I'm feeling quite positive for 3DS. I want the upcoming Picross 3d. I loved the first one and beat every puzzle, including the downloadable ones. Fire Emblem, Yokai Watch, Hyrule Warriors and then I guess Metroid, but only because it's Next Level making it. Is there any news on Monster Hunter Stories or that AC style spin-off with the cat things for a 2016 Western release? Would love to give them a go too! However - we all know that Hyrule Warriors is a fantastic game! Also - Metorid Prime - the only knock on this is that it wasn't what people were expecting! IT could be fabulous! I hope the performance of HW Legends is enhanced on New 3DS like MH4U was. Listen, I'm a HUGE Nintendo fan, but sometimes they make some idiotic choices. Federation Force is going to be garbage... And I think it's clear many of us would prefer a return to Super Metroid style on handheld, and 3d like Prime on NX. Next Level Games has been good, but it's amazing how out of touch Nintendo seems to be with its audience sometimes. The two games I really want to see haven't been announced (new Pokemon) or confirmed (Etrian V) for this year yet. From this list, Hyrule Warriors probably. I don't even like the Warriors games but the abundance of content (and characters I like) makes up for the repetitiveness, I think. I plan on maybe getting FF to play local multiplayer if it reviews decently. Pokemon Super Mystery Dungeon, Hyrule Warriors, Bravely Second, Fire Emblem, Metroid and Dragon Quest (both) are day one for me. Also, wasn't Ace Attorney 6 confirmed for this year? Fire Emblem! Bravely! ProjectXZone, FFExplorers and Dragon Quest! What amazing year for JRPG! The game I'm most looking forward to is one that hasn't been announced yet, the next main series Pokemon game (Z or whatever they're planning). RBY VC is also on my list though, and I'll give Federation Force the benefit of the doubt until we get some concrete details (although I'm doubtful it'll be good/what the fanbase wants). Other than that, I'm not impressed with the 3DS' lineup either, Nintendo's announced lineup is just all around subpar. I'm waiting for those Unity projects. I might finally have my first 'New 3DS' game to play nearly 2 years after getting the system. No, I don't play Xenoblade Chronicles before you defend it. Only in the west. Japan's lineup is arguably worse than the Wii U's. I should also point out that there's nothing coming from Nintendo themselves for the 3DS. Wii U at least has Zelda and Star Fox. I find your lack of Dragon Quest disturbing. @Caryslan Did you hear about Scalebound being delayed to 2017? First delay of the year unless you count Uncharted being pushed back from March to April. Edit: ReCore also got delayed technically, going from "Spring 2016" to just "2016". ReCore is also coming to PC (Windows 10 only). Looking forward to Dragon Quest 8. Missed out on the PS3 original so I can't wait for the 3DS release. I'm completely burnt out on role playing games. They have saturated us with those and little else lately. The only game on that list I want is style savvy 3 (new style boutique 2). Since Fire Emblem Fates doesn't have a release-date for Europe yet, I picked Bravely Second, because I'm pretty much equally excited about those two games. I'm looking forward to Final Fantasy Explorers, Fire Emblem Fates, and DQVII. Might pick up Federation Force if reviews are strong. BTW its strange to see LEGO Avengers on the Wii U list but not this one. Not that I am really forward to that game, but it's just an observation. In Japan, 3DS gets Monster Hunter Stories, Yokai Watch 3 and Dragon Quest XI in 2016. That's already better than the 2016 Wii U Japanese lineup. Now, from a first party standpoint only, one can argue that the 2016 Wii U Japanese lineup is better than the 2016 3DS Japanese lineup. cant wait for FE Fates!!! and DQ XI !!! its too much for just 2016, right? Zero Time Dilemma by far. Second place would be a tie between Shin Megami Tensei IV Final and Fire Emblem Fates. 2016 is looking great, after all, my top 3 favorite games in 3DS are Virtue's Last Reward, Shin Megami Tensei IV and Fire EMblem Awakening, and all three of them are getting sequels. @IceClimbers Hyrule Warriors Legends kind of counts as the game is not completely in Koei Tecmo's control. Honestly, this year is looking reaaaally underwhelming for both 3DS and Wii U. Star Fox Zero might be good, SMTxFE might be good if you can tolerate high doses of weeb... But at least SMTIV Final and the DQVII localisation smells like a fun time. I don't mean to come off rude here, but I don't recall either of us referencing Japan in any way. Nothing in the article implies the Japanese lineup either. Not saying you're wrong, as I honestly don't know, by not living in Japan or paying much attention to their software releases. Simply put, I don't understand your correlation, or why you chose to pay attention to that, based on what we said. @Peach64 and I were just talking about what's here in the article. I shall also say that both Star Fox and Zelda are delayed games originally slated for 2015. Nothing significant would be coming from Nintendo on Wii U this year, if the stars had aligned last year. Red Blue and Yellow all the way! Zero Time Dilemma, no question about it whatsoever. I'm really eager to play Fates as well, though. It's by far my runner-up choice, although there's a plethora of other upcoming games - mostly JRPGs that I can't wait to grab, such as SMT IV Final, Etrian Odyssey Knight of Fafnir or Project X Zone 2. Yeah, it doesn't look quite as slow and doesn't seem to have that façade of a cohesive world when it's disconnected all around. I'm personally glad Metroid Prime Federation Force is just familiar, because the main games are just a bit boring and bloated. Outside of the art style, Federation Force is very close to what I've been wanting out of a Metroid release for nearly a decade: engaging multiplayer. I cannot wait to play this new Metroid game with my siblings, and explore what all Federation Force reveals and implies about the Prime universe. I will be buying and may even be buying multiple copies. And NintendoLife continues to use the Pokemon anime to represent the games, despite them being two different things. I voted for Zero Time Dilemma, as I'm incredibly eager to see how the Zero Escape trilogy will be wrapped up (especially since Virtue's Last Reward ended on an enormous cliffhanger), but two other 3DS games I thought we'd never see, Dragon Quest VII and VIII, are right there with it. Those are the two games I'm most excited about! Especially VIII! VII has taken YEARS to get a localization! @I-U You are part of a very limited minority who would pass on an engaging single experience in favour of a multiplayer experience that doesn't look Metroid-ish at all. The prime games revolutionized the way gamers want to see the Metroid franchise in 3D, so whether you like those games or not, everyone knows that those games greatly raised the bar from what we want in a metroid adventure, that's why Other M failed miserably and why this game is also condemned to the same fate, Nintendo not knowing what their audience wants is the issue. @FRANKLIN_BADGE: How did you come to the assumption that I would pass on an engaging single player experience from Metroid? My favorite game in the series is Metroid Prime Hunters because it has both an engaging single player and engaging multiplayer. Having nailed both so well, that game ultimately made me perceive the rest of the series as half efforts in comparison, no matter how good they are in a particular aspect. My hope, in spite of its art style choice, is that Federation Force will engage me in both single player and multiplayer again within the Metroid Series. I would not get that from a Prime 4 or whatever else the fanbase "wants." My vote is definitely for Zero Time Dilemma! Our dreams are here! Ever since the first DS game.. it's finally going to be all over. I can't believe it. Definitely picking it up as soon as it comes out. Hyrule Warriors and Fire Emblem also look amazing, though. HW works better as a portable experience than a console one in my opinion. It doesn't, it takes place before it in the in-series timeline, however some of the characters may or may not be from the future. Final Fantasy Explorers, me and a group of friends have been craving it for some time now. I can't wait to put in all those hours together. Some great stuff coming to the 3DS. Fire Emblem is a no-brainer but I'm also super glad that Zero Time Dilemma is even happening (the two previous games are fantastic) and that Bravely Default's sequel gets a chance to shine. Oh and there's that thing called Pocket Minions being re-released or something. Hot tip for the new year perhaps? Fire Emblem Fates - I'm terrible at SRPG's, so as per usual, I'll pass on playing this latest instalment of Fire Emblem. Hyrule Warriors Legends - Tempting; I'm not a huge fan of playing on the 3DS due to it's constantly breaking L and R buttons, and would rather just download the additional characters for the Wii U version I already have, but this is a very tempting purchase. Metroid Prime: Federation Force - My younger brother and I both plan to get this game. Admittedly, part of what is convincing us to get this is simply because of how angry it has made so many people, but a bigger reasoning for me is that I trust Next Level Games to make a good product. It also looked incredibly fun during the E3 treehouse showcasing. Project X Zone 2 - Seeing all the characters together like this is cool, but otherwise, I've no interest. Bravely Second: End Layer - I made a video recently on my top 6 most anticipated games of 2016, and Bravely Second was listed as number 4. I really enjoyed Bravely Default and am eager to play it's sequel. Final Fantasy Explorers - Now if this was a traditional turn based Final Fantasy (though the Bravely series kind of covers that now) or a Final Fantasy Crystal Chronicles title I might have be interested, but Explorers has yet to interest me so I'll be passing on this game. Zero Time Dilemma - I think I remember one of the previous titles being shown off in a Nintendo Direct long ago. Once again, I'll pass. Mario & Sonic at the Rio 2016 Olympic Games - If I were to get this game, I'd get it for the Wii U, but I'll pass on the 3DS version. Sonic Boom: Fire & Ice - A maybe I guess. I enjoy the cartoon, and if this improves on the okay 3DS titles, it should be decent enough. I've plenty of other games I want this year though so... undecided and not likely, but still worth considering. Pokémon Red / Blue / Yellow - I already have Pokémon Red, Blue, and Yellow in catridge form... but having it on my 3DS is very tempting. I think this would depend on whether any of my brothers decide to do so as well, or if we're able to make screenshot enabled Miiverse posts for it (unlikely, given the previous Pokémon Miiverse communities). This is definitely a weaker lineup than the Wii U. "Fire Emblem: Fates" is the only must-buy game on the list for me. I need to know a lot more about "Metroid: Federation Force" before I can make a decision on that. "Project X Zone 2" is a possible eventual purchase, but I still haven't gotten very far in the first game. "Pokémon Yellow" would be nice if I didn't already have a still working cartridge of it. I don't know why anyone would consider Red or Blue versions when FireRed and LeafGreen surpass them in every way except online play (and the 3DS games are better for that, anyway). The rest don't interest me at all. What a depressing list. The only thing that looks even remotely interesting is there's a picture that contains both Mega Man X and Phoenix Wright. Well, that and ROMs of 20 year old GameBoy games. Everything else here is pretty much rubbish. I mean you had to include shovelware like Sonic and Mario At the Olympics to fill out the list. 2016 will be a terrible year for 3DS unless Nintendo has some surprises up their sleeves. @FRANKLIN_BADGE "Other M" didn't "fail miserably." It's got some of the best gameplay in the whole series, an excellent presentation, and an interesting story. It just needed better dialogue, a logical reason as to why it took so long to activate the Varia Suit, and perhaps a better in-game explanation as to why Samus respected Adam so much and initially froze up upon Ridley's return to have kept those feminists from overreacting to it. "Federation Force" looks like it could be an intriging side-story like "Hunters" and could very well deliver some very solid gameplay. I look forward to learning more. Zero Time Dilemma is my most anticipated. Second would be Federation Force. I was kinda excited for PXZ2, EO2, Bravely Second and Fates at one point, but they just seem so similar to the previous iterations that I can't help but think "why bother". Plus, I've already blasted through the best part of the first three, the soundtrack. Too much fan service in this list , Needs new franchises and more indie games , Zero time Dilemma looks pretty good i will probably pick up that one, The rest.. ehhh not too sure but Bravely second from the trailer looks pretty amazing for an RPG and if Project x zone 2 comes out cheaper than full price maybe maybe. Metroid is what I'm looking forward the most, want a co-op FPS on the 3DS, then Hyrule Warriors since I don't own the U version and rather have it portable. The rest isn't my cup of tea, although I might be interested in picking up the gen 1 pokermans. Zero Time Dilemma for me! Also still hoping that Style Savvy 3 gets a date this year. Fire Emblem is pretty much only reason I have / keep my 3DS so there goes my vote. 3D only on the new 3DS version. "The prime games revolutionized the way gamers want to see the Metroid franchise in 3D, so whether you like those games or not, everyone knows that those games greatly raised the bar from what we want in a metroid adventure, that's why Other M failed miserably and why this game is also condemned to the same fate, Nintendo not knowing what their audience wants is the issue." If Nintendo had announced that a new Metroid (in the classic sense) was in the works, the overwhelming negativity would have been more limited, or most likely, ignored. In other words, there wouldn't have been nearly as many sharpened pitchforks, and most likely, those people would have gotten over it quickly. Let's be fair to Next Level too, I'm sure it'll be a decent game in it's own right, and I feel bad that they get the brunt of Nintendo's decision. However, what is completely baffling is Nintendo's utter failure to realize how upset people would get with a spin-off multiplayer game, with no acknowledgement of the future of the series. A perfect example is that we knew a new Zelda was being made when Hyrule Warriors was announced. Granted we did not have an "official" announcement, but we knew it was being worked on when Iwata said as such during the Windwaker HD announcement. Federation Force + No "classic" Metriod announcement or plans = Sharpened Pitchforks. @andrew20 Is that all? I was hoping for better textures or something? Disappointing that Paper Jam has only 5% of the votes. As of this comment that's just like 121 people who voted for the game. Zero Time Dilemma would be my pick from the list. Loved the first two games. Although if Ace Attorney 6 releases in 2016 that would be my absolute number one choice. After that the virtual console release of Pokemon Red, Blue and Yellow looks cool. Don't forget that results for that game are skewed because it released in Europe already. I'm not trying to discredit your statement, because I'm sure no matter what, the game would be on the lower end of the results. That said, the results are skewed nonetheless. P.S. While I am personally excited to play Paper Jam, it isn't at the top of my list this year either. Man, another killer year for 3DS! Also Hyrule Warriors Legends, Metroid Prime Federation Force, Dragon Quest 7, Dragon Quest 8, Bravely Second, Mario & Luigi Paper Jam, Final Fantasy Explorers, and hopefully, with a little luck, Monster Hunter X and Monster Hunter Stories. Fire Emblem Fates and Pokemon Red/Blue/Yellow top my list. Also, Federation Force looks like it could be really great. Sure, it's not the Metroid game we all wanted, but that doesn't mean it won't be good. I want them all except for Sonic. Who the hell cares? So many games. Fire Emblem, Bravely Second, FF Explorers, Yo Kai Watch, Stella Glow....I'm not sure I can keep up! There is no game I want more than Zero Time Dilemma. The first two games just blew me away. That being said, also very much looking forward to Bravely Second, Project X Zone 2, Paper Jam, and DRAGON QUEST 7 and 8!! I'm so happy Fates is leading the pack in votes. I hope it's a success akin to Awakening. Zero Time Dilemma. I really didn't have to think much about this.